LAGOS, Nigeria (AP) — Inside this 1950s-style American diner, waitresses softly sing along to Aretha Franklin as they sling hamburgers and whip up milkshakes. The jukebox belts out Ritchie Valens as a customer wearing a Muslim prayer cap and flowing blue robes ambles in. This isn't the U.S., where the kitsch restaurant chain Johnny Rockets has several hundred locations, but instead Nigeria, where foreign companies have hesitated to invest because of logistical challenges, poor electricity and government corruption. Now, however, as Nigeria's middle class grows along with the appetite for foreign brands in Africa's most populous nation, more foreign restaurants and lifestyle companies are entering the country. And the draw on Nigerians' new discretionary spending has also put new expectations on providing quality service in a nation where many have grown accustomed to expecting very little. 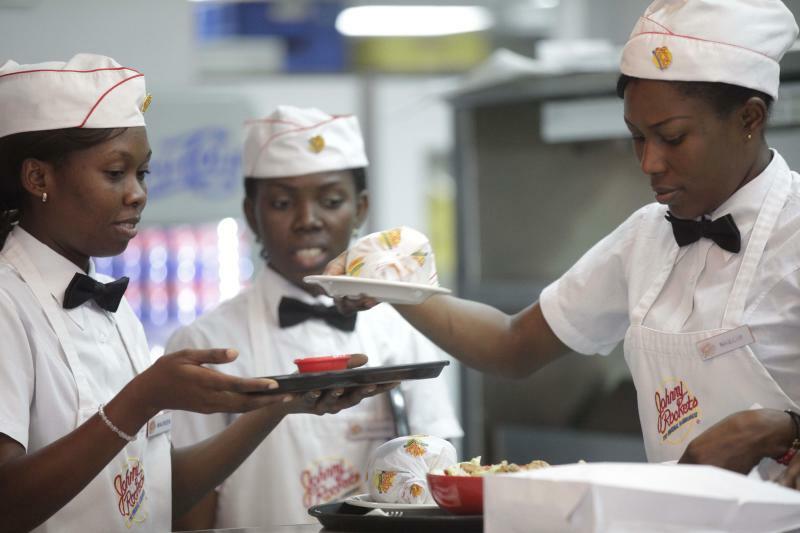 "It really is impressive to go out to places and see places filled with everybody from all different walks of life," said Christopher Nahman, the managing director at the Johnny Rockets in Nigeria's largest city, Lagos. "Nigerians are a very aspirational society also. Even somebody who it might be really kind of a burden on them financially, they will still do it to just have that experience. "It's very encouraging moving forward because that's what you need to sustain an economy. ... There's no going back." The majority of those who live in Nigeria, home to more than 160 million people, live in poverty. Just more than 60 percent of Nigerians earn the equivalent of less than $1 a day, according to a 2012 study published by the country's National Bureau of Statistics. For decades, only tiny sliver of the population either involved in the country's oil industry or its government roundly criticized for corruption had access to wealth. The end of military rule in 1999 saw the country's economy slowly open up, with new professional jobs being added in banks and the rapidly growing mobile phone market. That gave birth to Nigeria's rapidly growing middle class, whose members earn about $480 between $645 a month and represent nearly a quarter of the country's population, according to a September 2011 study by investment firm Renaissance Capital. The market has drawn U.S. restaurant chains as well. KFC, owned by Louisville, Kentucky-based Yum Brands Inc., has seen a rapid expansion across Nigeria, with 17 restaurants opening across southwest Nigeria. 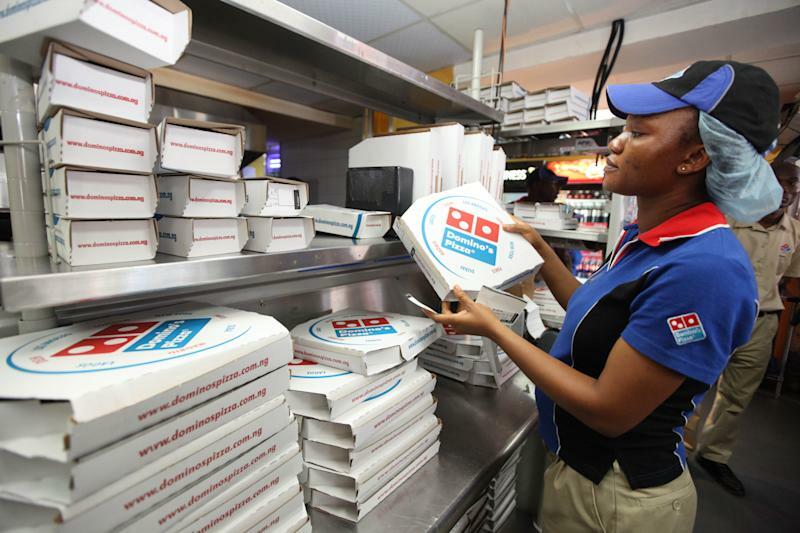 Domino's Pizza Inc. of Ann Arbor, Michigan, recently had a franchisee open two locations in Lagos as well. Even ice cream seller Cold Stone Creamery of Scottsdale, Arizona, has opened to offer scoops and waffle cones to take the edge off of Nigeria's sweltering heat. 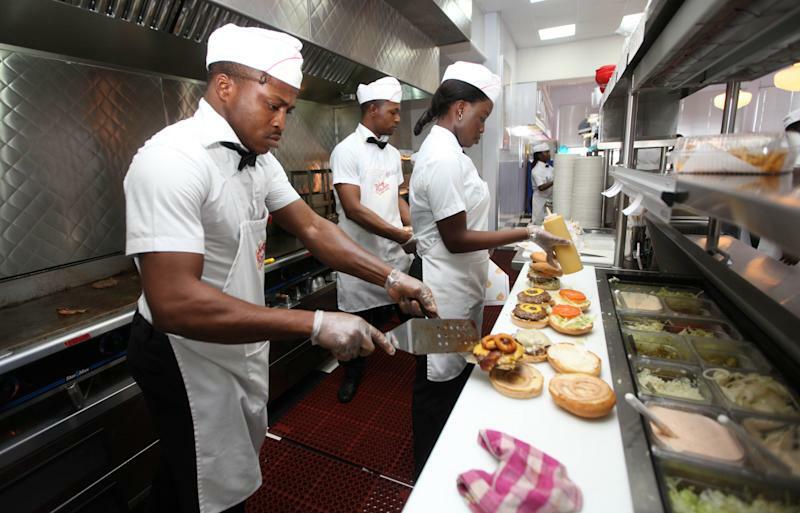 At Johnny Rockets, which sits on Lagos' swanky business-hub Victoria Island across the street from a major hotel frequented by foreigners and dignitaries, the restaurant has a velvet-roped waiting area in the parking lot. Inside, the stainless steel kitchen gleams and customers watch, often with open-mouth fascination, as workers dance each hour to "Hippy Hippy Shake" or another classic song. The menu of burgers, fries and onion rings has the Nigerian addition of jollof rice, a spicy staple of tables throughout the country. Others coming in have followed — including Domino's, which puts it atop a specialty pizza for the Nigerian market. However, most come for a taste of something different. That luxury does come at a steep price. A double bacon cheeseburger sells for 3,500 naira, the equivalent of about $22. A vanilla milkshake is 1,800 naira, or $11.25. Yet the service does come with a smile, a song and a bit of spectacle often missing in Nigeria, where customer service can quickly degenerate into exasperated shouts and curses at blank-eyed employees. "This, obviously, is not an everyday place," said Mimi Ade-Odiachi, a landscape and garden designer dining there recently with a friend. "It's a once in a while, I want to celebrate something small in my life" place. Despite the possible profits, challenges still remain for these companies. Stores must rely on diesel generators for electricity, as Nigeria's state-run power remains epileptic at best and blackouts can last days. Having adequate supply chains also can prove to be a challenge, as some Nigerian suppliers don't immediately meet Western standards and backlogs at the country's major port in Lagos can be weeks at a time. Corruption also remains rampant at government and regulatory agencies, analysts and private businesses acknowledge, making operating legally with proper accreditation even more difficult. Still, there's money to be made now and perhaps even more in the future if Nigeria's economy continues to grow along with a burgeoning middle class looking for an escape from the grind of life in the country. "People don't feel like they're in Nigeria when they come," said Andrew Nahman, a director at Johnny Rockets. "Not necessarily that they have to get away from Nigeria, but it's a different experience all together."